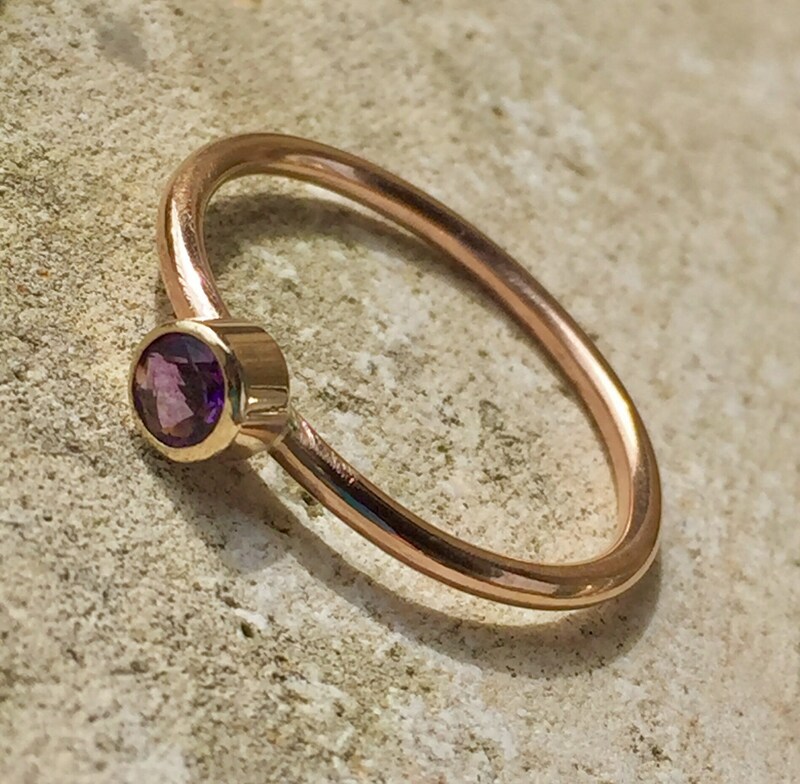 This simple, minimalist stacking ring is made of Grade AAA Natural Amethyst and solid 14k Rose Gold (the shank) with a solid 14k Yellow Gold bezel. Less is more with this elegantly feminine beauty! You also have the option of having the ring shank made in solid 14k YELLOW gold. Just choose at checkout, same price. I made this as a gift for me :-) Being a February baby and wanting something dainty, I sought to create a luxe item with rose gold, since I don’t wear much of it but was feeling the “need” to change up my style. I have been wearing it over a month now and each time I look at it, its minimalist “less is more” feel just makes me smile. The stone is natural. The deep purple is a result of being heat treated, which I chose to give an even more royal feel with the lush gold. It is faceted and 4mm round. The bezel is cast yellow gold. These bezels are my “go to” from my reliable supplier due to the high quality and thickness. The ring shank is handmade by me, of 14 gauge solid 14k Rose Gold. That means the shank is 1.63mm wide. Such soft pink shimmer next to the deep purple just exudes elegance and femininity. Goes beautifully with other stacking rings. At times I combine it with some silver and even a peridot stone ring. BUT it turns out that my favorite is to wear it alone so its beauty stands alone! This MADE TO ORDER ring will take 6 business days to create from the day you order. However, I always do my best to get it in the mail to you sooner! Beautiful. Love the lever backs. Packaging very nice. Included a polishing cloth.